Just when you thought it was safe to go back out into the bayou, along comes HATCHET 4 : VICTOR CROWLEY, which comes to UK DVD September 3rd. Set 10 years after the original film, and the soul survivor of the previous 3 massacres, former paramedic Andrew Young (Parry Shen reprising his role from Part 3) is out promoting his new book. In which he is trying to convince people that the mythical Victor Crowley was the infamous Bayou Butcher, responsible for the murders. Unfortunately, whilst flying out to his next book signing, his plane crash lands in the infamous Honey Island Swamps. 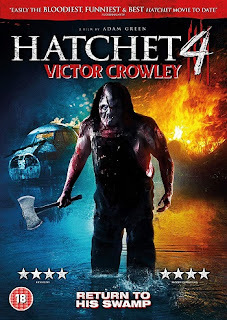 Just as Victor Crowley (Kane Hodder) happens to be ressurected by means of a plot contrivance. Trapped on a sinking plane with a TV crew and a group of teenage documentary makers, they find themselves trying to find a way out of the plane and past the blood-thirsty Crowley who's trying to get in and kill them. Director Adam Green returns once more to direct and as with the previous films, features a number of well known horror actors, including Fellissa Rose (Sleepaway Camp) and Tyler Mane (Halloween - 2007), along with Laura Ortiz (The Hills Have Eyes - 2004) and Dave Sheridan (Scary Movie). Boasting a pleasing amount of gore, the film does however look like it didn't have the budget of the previous films as most of the action seems to take place inside the plane and clocking in at around 1hr:19, isn't all that long. But is otherwise very entertaining. If you enjoyed the previous films, you should love this. There's plenty of blood and guts to keep gore hounds happy and a very VERY warped sense of humour prevalent throughout and the disc also comes with a great selection of extras.